Liebherr Machine Tools India established in 2003 is a joint venture between Liebherr-Verzahntechnik GmbH-Germany and Francis Klein. Liebherr-Verzahntechnik GmbH-Germany is a leading manufacturers of CNC Gear Hobbing machines, Gear Shaping machines, Generating- and Profile gear grinding machines and gear cutting tools. Critical components are imported from Liebherr-Germany and the machines are completed in Liebherr-India giving customers’ German quality at an affordable price. Local application & service capability ensure that customers get maximum utilisation throughout machine life time. Production machines for gear hobbing, shaping and grinding for the automobile industry upto 500 mm workpirce diameter. Universal machines featuring up to 15,000 mm workpiece diameter. Special machines for finishing by generation and profile grinding. Program contains a full production series of machines from 80 mm to 15,000 mm workpiece diameter. 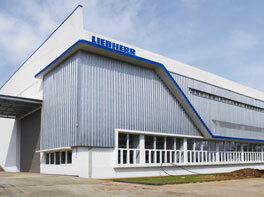 Machines upto 2000 mm are available from Liebherr India while larger machines are produced in Liebherr Germany. The gear shaping machine program covers a range of 80 mm to 4500 mm workpiece diameter. Machines upto 500 mm are available from Liebherr India while larger machines are produced in Liebherr Germany. The gear grinding machine program covers a range of 150 mm to 1000 mm workpiece diameters offers a machine system for precise finishing of hardened gears.